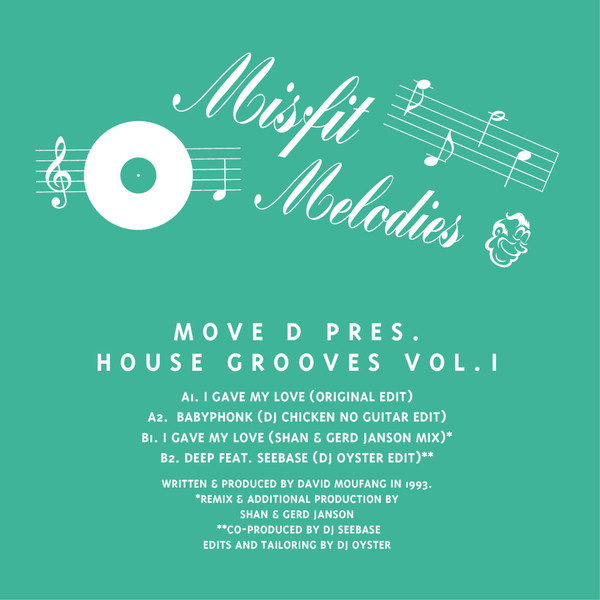 At the behest of Misfit Melodies, Move D dusts down his House Grooves Vol.1 (1993) tracks, backed with new remixes and edits from DJ Chicken, DJ Oyster, and Shan & Gerd Janson. The square-bassed, filter-tweaked and piano-heavy budge of I Gave You My Love catches him in fine fettle, and comes packed with a rolling breakbeat edit by Shan & Gerd Janson which ain’t a patch on the original, to be fair. The more laid-back Babyphonk is trimmed of its original guitar stubble for smoother effect, and the Hardrive-sampling Deep is pared back to the essentials - simmering garage hook and slippery swing - with a lush underlying tension in DJ Oyster’s edit.